Sarah Sutcliffe’s trip to Solomon Islands is part of our efforts to support and encourage young Australians in study, careers and volunteering in international agricultural research, our Crawford in QLD International Agricultural Student Awards will be supporting 14 Australian tertiary students to gain international agricultural research experience and expertise. The Crawford Fund Queensland supported Sarah Sutcliffe, a James Cook University Honours Candidate, to travel to the Solomon Islands this year to further her research on media representations of fish for Pacific Island food security. 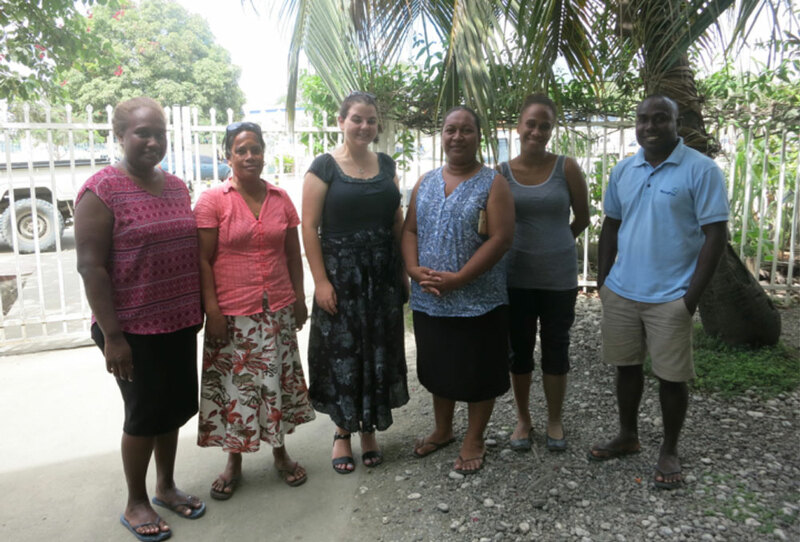 Sarah’s research consisted of a desk-based analysis supplemented by stakeholder interviews in the Solomon Islands. My hosts, the WorldFish team in Honiara. Photo: Sarah Sutcliffe. It is estimated that 1000 million people in Pacific Island Countries and Territories (PICTS) are dependent on coastal reef ecosystems for their food security, and the future of their food security is uncertain, as coastal fisheries are subjected to overfishing, and climate change impacts both fish and other agricultural food production. It is likely that by 2030 most PICTs will be unable to produce the required quantity of fish and distribute it across the entire population. Responding to a potential fisheries crisis will require significant changes in the way that fisheries are managed. From an Australian perspective, public awareness, perception and engagement in these issues is important because the Australian Government is a significant investor in aid in the Pacific, including the Solomon Islands, and a significant proportion of this aid is directed towards rural development and improving health and nutrition. Within the PICTS, including Solomon Islands, the reasons for engaging the public in the issue of fisheries and food security are significant. Firstly, food security, especially good nutrition, is a public health concern; secondly, fisheries are a direct concern of a majority of the population, as small-scale fisheries provide 90 per cent of animal-sourced food consumed by Solomon Islanders and 83 per cent of households participate in small-scale fisheries; and, more than 90 per cent of coastal areas of Solomon Islands are under customary tenure and as such managing them is a public issue, so there is an obligation to ensure public participation in the process of developing fisheries for food security. “A systematic analysis of media representations of the role of fish in Pacific Island food security was critical to understanding the information currently being presented to the public, and how this may need to change to better inform and garner public support for the changes needed to ensure the ongoing food security of the Pacific Islands,” said Sarah. Honiara fish market. Photo: Sarah Sutcliffe. Sarah analysed articles from newspaper publications in 2016 from Australian and Solomon Island media outlets. She found that despite the significance of fisheries and food security to the lives of most Solomon Islanders, there were relatively few articles referencing either subject. Compared to 1651 articles about development and 394 articles about climate change, a mere 280 referenced fish and 68 food security. Only 21 articles, across four publications in an entire year, contained references to both, and only 14 drew a direct link between fisheries and food security. 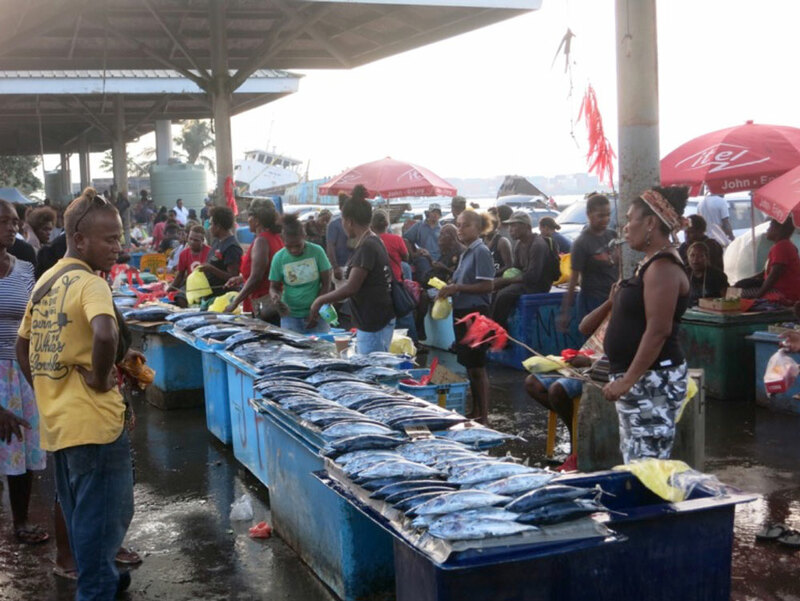 Following this analysis, Sarah travelled to the Solomon Islands to conduct interviews with managers, researchers, NGO representatives and journalists to understand what strategies are utilised by fisheries agencies to communicate with the public, particularly through the media. “By conducting interviews with these stakeholders, I was able to determine the context around media coverage and explore the mechanisms currently used to communicate to the public around the subject of fisheries and food security,” explained Sarah. Key findings from Sarah’s stakeholder interviews included agreement that fisheries and food security and the connections between them were under-reported; a dominance of tuna coverage over that of small-scale fisheries prevails; recognition that coverage frequently lacks depth; acknowledgement that most Solomon Islanders in regional areas having limited access to newspapers; and, a real need for targeted on-ground local communication and media collaboration. Most promising of Sarah’s research results was the feedback she received from journalists in the Solomon Islands. They were eager to publish more articles on the subject, wanted more information from agencies, and wanted to write more articles about ongoing work, rather than simply publishing responses to isolated issues and events as they arise. Sarah’s research concluded that there is limited acknowledgment of the state of fisheries, and the threat of failure to meet food security requirements and more recognition is needed of the importance of managing for stable, climate change resilient fisheries and agriculture to ensure food security. Specifically in relation to communication, Sarah found that there is a need for people working in fisheries and food security to ensure they better target affected people, both in terms of the content and the medium used; and, that there is potential for agencies to release more detailed information more often to allow for increased quantity and quality of media coverage.